The Life rank was originally an award that followed the First Class Rank for a Scout who had earned 5 merit badges related to health and fitness (First Aid, Athletics, Life-saving, Personal Health, and Public Health). 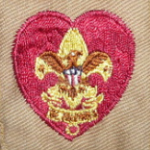 In 1927, the Boy Scouts reorganized the awards and Life began to follow the Star Rank thereafter because they requirements for Life were actually more difficult to complete and hence most Scouts who earned Life were also awarded Star at the same time. 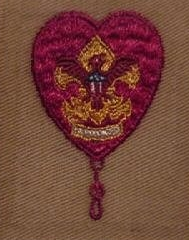 There are at least 7 different styles of early Life badges with differences in the location and design of the knot, the direction the eagle faces, colors used in different parts (especially the scroll and motto), as well as many differences with the pattern of embroidery. 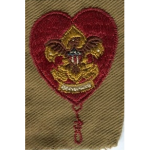 For help identifying the age, type, and value of your Life Rank badge, please Contact Us!